Guest review by Sue Stirling, who also reviewed Handa's Surprise on The Book Chook. Sue has a new blog where you'll discover great literature activities. Find more children's book reviews by clicking Reviews in the right sidebar. Sometimes a book comes along that you just love - from cover to cover, and for so many reasons! 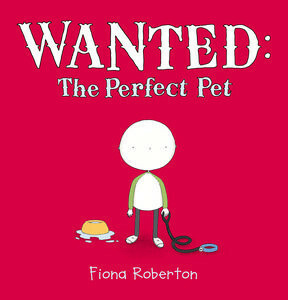 Wanted: The Perfect Pet by Fiona Roberton, published by Penguin 2009, is one such children's picture book. The illustrations are created in a clever, child-like manner, with simple lines and creative use of colour. Henry is a boy who is desperate to own a pet, preferably a dog. Regardless of the fact that he has twenty seven frogs, he wants an exciting pet, one with personality and capable of doing all manner of tricks. Without giving too much away he goes to great lengths to find a pet. The author cleverly writes the story in three very short chapters, giving children the opportunity to hold on to the sequence while another little tale is told until finally the story is woven together. There are many opportunities in the story for children to further develop kindness, sharing and acceptance of others. The illustrations are endearing, the text is cleverly crafted and you feel a warm glow when you read it, even though you are an adult reading a child’s book. I've read the story to a group of pre- primary children, and they thoroughly enjoyed it. Many of the children understood the nuances of the story and one little girl said, "Oh, now I know why Henry got his Enormous Book of Incredibly Interesting Things off the bookshelf!" I won't spoil the story by explaining further! I was delighted to find that Fiona Roberton has written another equally delightful story of the two friends. If it's possible, The Perfect Present is even more enchanting. The two friends are together again and in this story their friendship is tested. Penguin publishers have put together teaching notes to accompany The Perfect Present so you will need to buy both of them! Here are the teacher notes. Giveaway News: The Chris Haughton Limited Edition Print will soon be wending its way to Julie C, of SA. Thanks for all of the children's book reviews you do. The majority of them make it onto our "to read" list. @Gabrielle I'm so glad, Gabrielle! Thanks for letting me know. I'm always looking for great new books. Also thrilled to find new reviewers like Sue Stirling who introduce me to new and exciting titles. This book sounds delightful. Thanks for the review.